The Rawlings Conservatory recently received a substantial gift – a contribution of 152 orchids grown by award-winning Maryland Orchid Society member Leslie Kirkegaard. The plants decorate the orchid room display while they are in bloom. 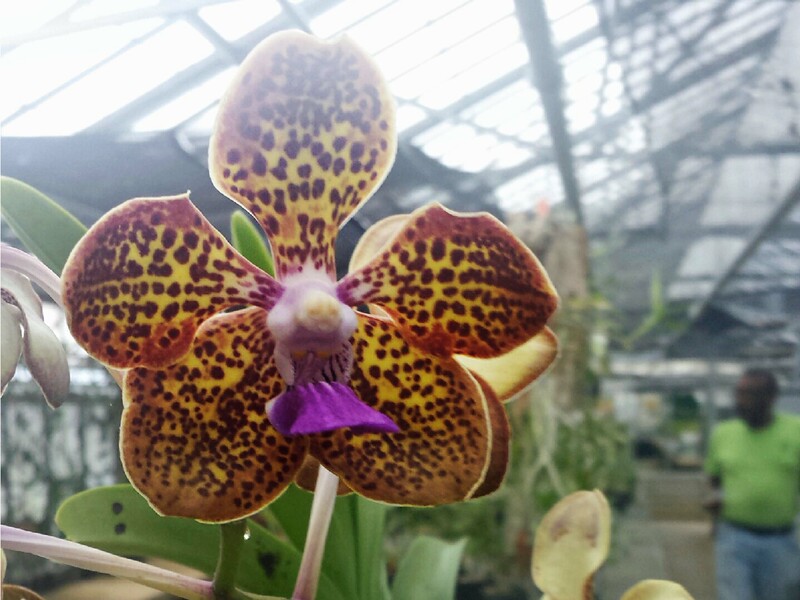 The collection is housed at Cylburn, and it takes up an entire bench that runs the length of the orchids greenhouse. The remarkable specimens show the grower’s skill with growing Paphiopedilums (slipper orchids) and Vandas, especially. Also present in the collection are cuttings of a variegated variety of vanilla that is new to our collection. Says John Carter (the BCRP staff member in charge of orchid production), “This Vanda is over 40 years old!” Les won awards in many classes, but most frequently for his exquisite multi-stemmed Paphiopedliums. As we explored the new collection, Horticultural Assistant Sandy Reagan noticed the unconventional potting medium used for many of the plants – he made his own. According to an article in the Maryland Orchid Society newsletter, Les experimented with hydroponics and bark formulations to find the best systems for growing his prize plants under lights in his basement and garage. He also worked on developing plant food to feed both the plant and media microbes. Les was educated as a biochemist and had a career in research and development. The collection was donated by his wife of 51 years, Carol Kirkegaard.